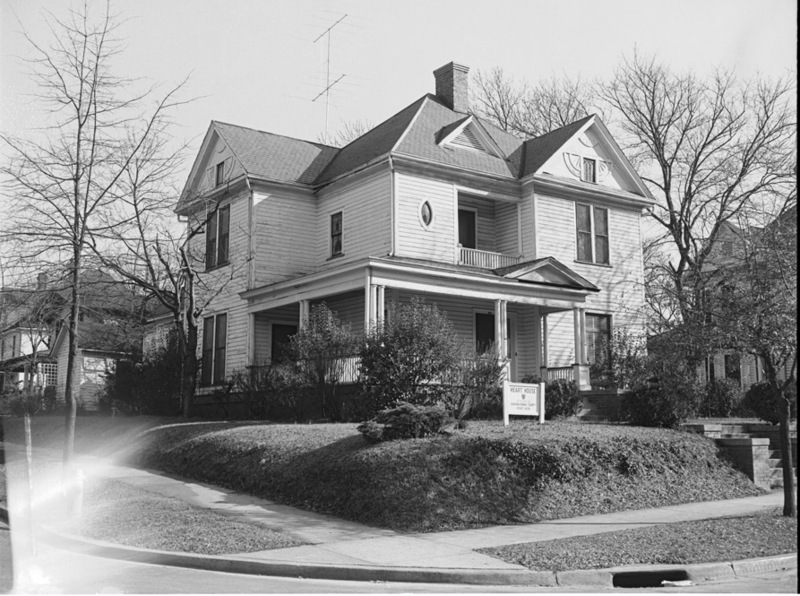 The 100 block of Watts St. was an area of early residential development in Trinity Park. 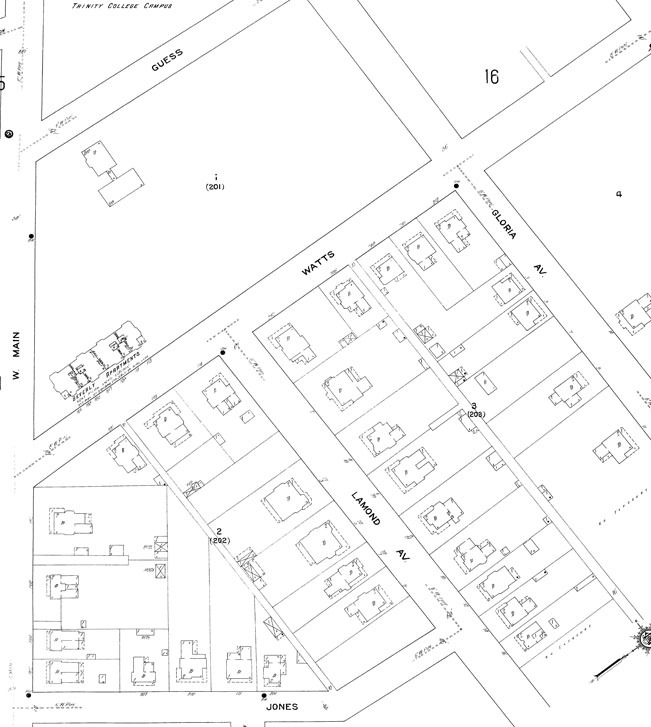 The Sanborn map from 1913 shows the hospital and the Beverly Apartments building, but no other houses on the west side of Watts. Morgan Street terminated at Jones St. (now Albemarle) and the blocks between Main and Lamond are developed with sizable residential structures. 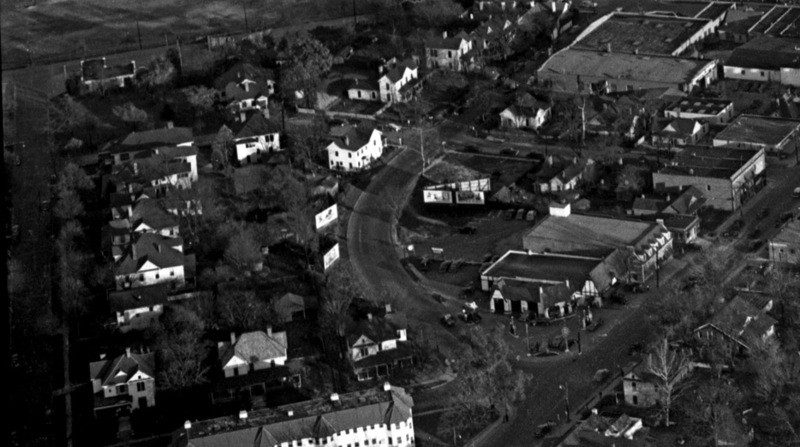 By the 1930s, Morgan St. had been extended through this block to connect with West Main St.
1950 aerial showing the intersections of Watts and Morgan and Watts and Lamond. Looking southeast from Watts and Lamond, 01.29.52 at the "New Heart House"
By the late 1960s, these residential structures had been demolished to create surface parking for the McPherson Hospital, located across Watts St.
McPherson hospital became North Carolina Eye and Ear and the North Carolina Specialty Hospital. The hospital moved in stages to the medical disneyland of Independence Park (near Durham Regional in north Durham), completing the move in spring of 2005. By that time, this site and the hospital site were already under contract with Lou Goetz's Park City Development, which tossed about various ideas about what they might like to do with the site in 2004-2005. A prominent feature in the early discussion was the idea of turning the old McPherson hospital building into a 'boutique hotel' - however that's actually defined. The hospital surface parking lot betwen Lamond, Watts, and Morgan would be redeveloped with infill, 'upscale' condominiums. After the sale of the hospital parcel to Concord Hospitality, the plan for the parking lot shifted to a denser, multi-family development, termed 'The Chancellory'. 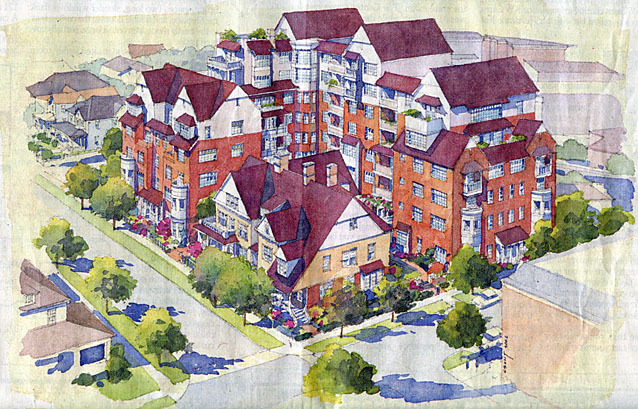 Rendering of 'Phase Two' - looking southeast from Lamond and Watts. A picture from a similar perspective as the rendering. The site plan for phase 2 shows the central courtyard and the entrance to the underground parking at the lower right. My version of a 'new' area plan. - the purple arrow connotes the viewing direction of the Phase Two rendering, from somewhere in the air above Lamond and Watts, looking southeast. I'm in favor of higher density projects like this - I think the interests of downtown Durham as a whole will be well served by increasing the population downtown. While this project is on the edge of Trinity Park, it is 2 blocks from Brightleaf Square as well. The project abuts a neighborhood of single-family homes and small-scale commercial structures, but it would be difficult to find this much open space in this area that didn't involve tearing down historic buildings (except, of course, the giant surface parking lots at Brightleaf, which I hope I live long enough to see put to better use). I'm also not concerned about traffic. As long as we don't reflexively start widening and demolishing to accommodate more cars, congestion will self-regulate (and, eventually, provide the impetus to make better, more efficient use of transit). However, it bothers me that the developers present what I consider a disingenuous figure for the density. The total residences in this Phase Two of the project is 48. Although the residences are only on the parking lot parcel, they utilize the acreage from the entire project (the hotel as well) to calculate the residential density. Thus the density is calculated as 20 dwelling units/acre rather than the more accurate 60 (48 on 0.8 acres). I'm not against the density, just presenting numbers that provide a misleading picture. This is a high-density project, not a medium-density project; own up to it and defend it honestly. More broadly, and with regard to the entire project, I tend to think that the majority of problems that arise in eventually contentious development scenarios result from slippery, misleading, or shifting information that the residents receive from the developer. I believe that a lack of forthright dealing was the major problem in the Central Campus scenario rather than retail per se. It is difficult for a neighborhood to have confidence in a project such as this when, according some of the residents, the developer objects to a development plan because it would be "unncessarily binding" and then, after rezoning, sells the hotel portion of the project to an Applebee's developer, who increases the number of hotel rooms by 1/3 and adds a large parking deck along the back of the property, and then says it will be an 'extended stay hotel' rather than a 'boutique hotel'. No rendering is available to the public - and the elevations aren't easily available. The development changes from an attractive, contextual redendering of a hotel that addresses the entire street and neighborhod to something out of the knee-jerk suburban playbook. How much the changes that occur result from shifting market conditions versus a pre-meditated shift once approvals are in hand, I don't know. But the appearance to the residents is that the developer has been trying to slip something by them all along - which, of course, makes everyone dig in their heels. Padding profit margins through increased neighborhood nuisance is not an acceptable strategy. As a result of some of the changes that have occurred, there's a mixed reception to this project in Trinity Park (and development changes do always seem to move towards more/bigger buildings, more parking, less amenities). I know that some neighbors plan to oppose the project height and density at a Board of Adjustment hearing this month. Because I believe in the high-density infill development represented by Phase Two, I hope that a compromise can be reached to allow this project to move forward with honest brokering and the minimum nuisance to the neighbors. I know there is a Development Review Board hearing for the Phase One/ hotel portion as well, and I hope that residents manage to sink the project as proposed. Durham deserves better. Further, I hope this will help spur Trinity Park to do the right thing by seeking local historic district designation. Perhaps with encroachment from the north (destruction of the DC May house on Club Blvd) and the south, the neighborhood residents will see their individual interests in designation, even if they have been unable to see the community interest to this point. Rendering at Watts and Lamond, looking southeast, 2009. The site is now on the market with CBRE for $1.2M. The CBRE pitch is for a developer to build a 80 unit multi-family development (now allowed under the new downtown overlay zoning) with a combination of ground level parking and underground (one level) parking.